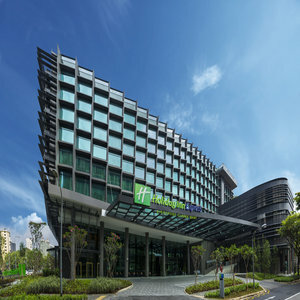 Smart International Hotel in Singapore, Clarke Quay with free Breakfast and Wi-Fi offered The new Holiday Inn Express Singapore Clarke Quay is the smart choice for savvy business and leisure travelers, offering a relaxed affordable and hassle free stay every time, located minutes away from Central Business District and Clarke Quay , the trendiest riverside nightspots and dining options. Our great location offers accessibility to Singapores major attractions included Chinatown, Sentosa Island, Universal Studios, Gardens by the Bay, Suntec International Convention Centre and the world-famous shopping district of Orchard Road , we are near the mouth of the Singapore River, just a short 30 minutes drive from Changi Airport , 5 minutes walk from the speedy MRT Subway train, Clarke Quay and Chinatown Stations . Relax in one of our 442 brand new and well-designed rooms with floor-to-ceiling windows. Kick start your day with our free Express Start Breakfast or Grab and Go option and stay productive with our free high speed Wi-Fi throughout the hotel . Experience our high quality bedding , have a restful night with a choice of soft and firm pillows, have an invigorating shower with our high quality bathroom equipped with a rain shower to recharge after a long day and have everything in control with our self service laundry facility.